If I had woken up and looked out the window not knowing where I was, would I have recognized my location? Looking out the window, I instantly knew (like Dorothy in the Wizard of Oz) that I wasn’t in Kansas anymore. Although France, like England, has been experiencing drought conditions, recent rains and the burgeoning of spring have turned the whole world green. The numerous oak trees are in transition. I see their gnarly, lateral branches, straight out of some witchy Walt Disney movie. The budding leaves are just unfurling – their scalloped lobes are clearly visible. 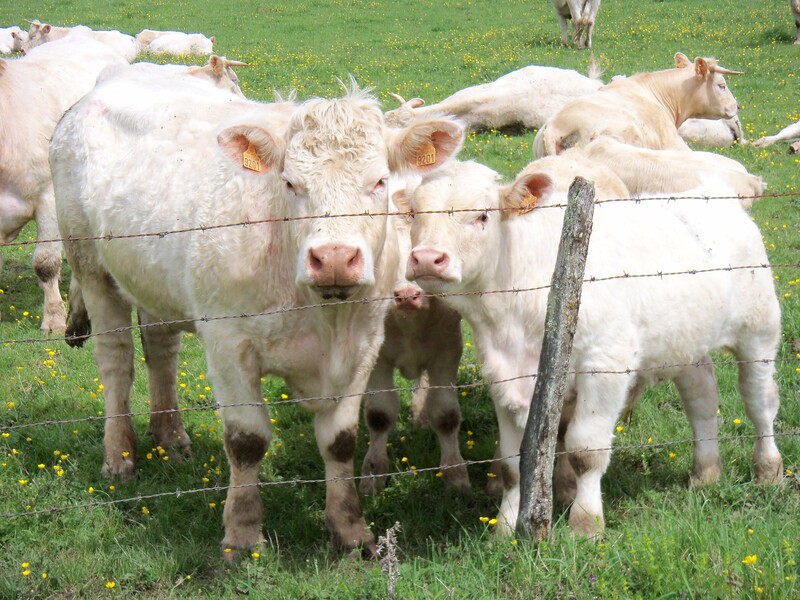 In the fields, I see sheep and white Charolais cattle. In the States, we may see Charolais, but most likely as a novelty breed at the State Fair. Here in France, they are a dime-a-dozen. And so, more than any other clue, the cattle give our location. The sun is shining although the there is no guarantee that it will last. The weather is very unstable: in any given day we have sun, showers, and squalls. I’m aboard a barge moored at Fleury sur Loire, a small village on a wide canal that runs parallel to the Loire River. According to our reference book, I can cycle to an unspoiled beach some 8 kilometers away. Or I can check out the remains of a Roman Villa, a 12th century church, lengths of the old Roman road or a 13th century château. I’m spoiled for choice. If I should miss the château coming up on our right, I can catch another. How blasé! A fan of cemeteries, I check the Fleury village memorial to the fallen soldiers. 41 died in WW I; 3 in WW II. I want to take a look at the WW I battle lines. How could so many men die from such a small village? And what of the women? Was the village larger during the WW I period? I can’t tell you how much I miss having Internet close to hand. I miss having a question and being unable to instantly look for the answer. I am so spoiled. Apremont-sur-Allier is a “three-flower village,” a designation awarded places of distinctive beauty. 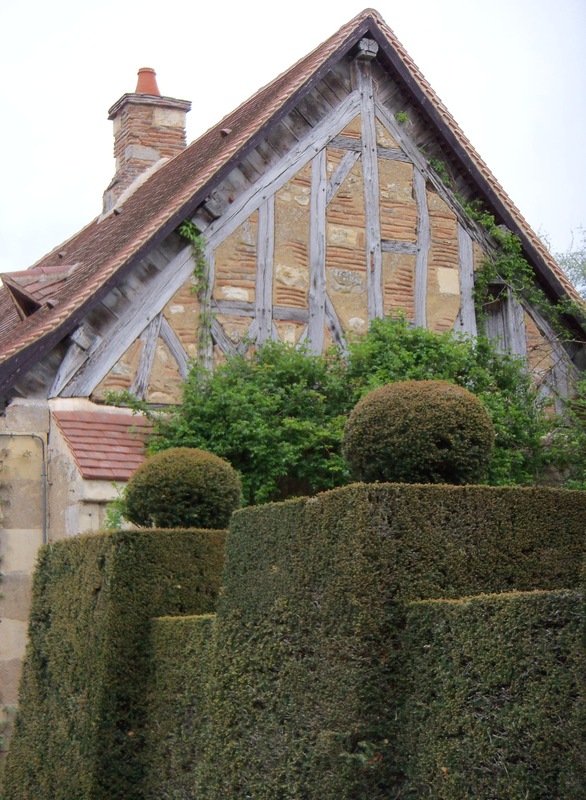 Charted in 1467,, Apremont-sur-Allier features a château at the top of a knoll, and at a lower elevation is the village that at one point housed the château’s support staff- the farmers, the domestic help, the folks who kept the fiefdom up and running. Today the restored château features five of the original 14 defensive towers. Rather than a hodge-podge of helter-skelter houses built over the centuries, the village houses are uniform.. During the 1930s, Eugene Schneider (one member of the Schneider family that has owned the estate since 1722) undertook the most recent restoration. Houses not in keeping with the medieval style were demolished, and new houses were built to a medieval architectural standard. The village is beautiful, but it feels synthetic. I’d rather see three, authentic, medieval houses in a mis-matched village. Every “regular” village we cruise past has storybook depth. Every house in every village (stone or stucco over stone) is a treat to the eye. If only the houses could talk – they have seen so much – what stories they could tell! Nearly all houses have working outside shutters (not to be confused with merely decorative shutters). My first impression was that nearly all homes were closed for the winter, but the shutters are closed on a daily basis. Should a home with shutters need to make an insurance claim, shuttered homes will have an easier time. Life aboard is a barge is very slow. We have covered 85 miles in two weeks of travel. We putt along at a snail’s pace. Navigating the canals is an exercise of life in the slow lane. Sometimes the gates are open in our direction. Other times we have to wait for approaching boats to come our way and clear the lock before we can enter. 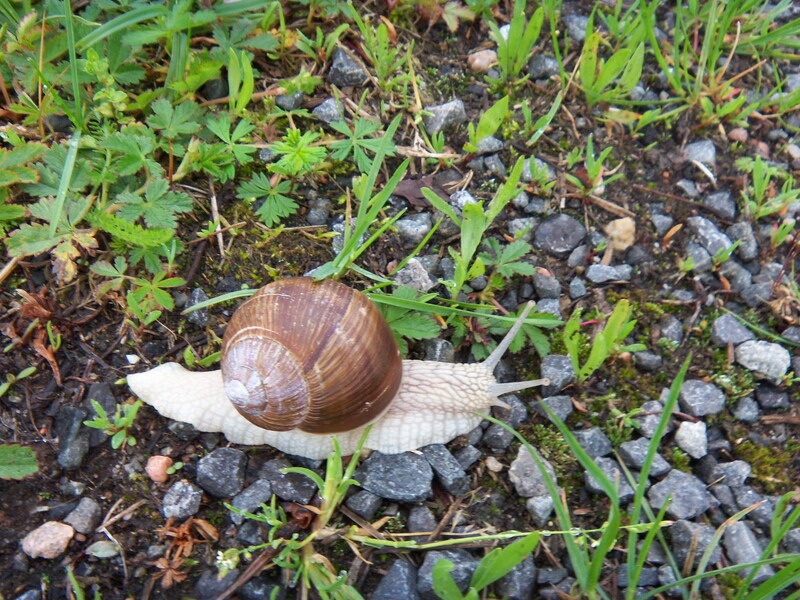 Walking the rural by-ways , I have seen many snails. Some are king-prawn size – one is big enough to serve as an appetizer. 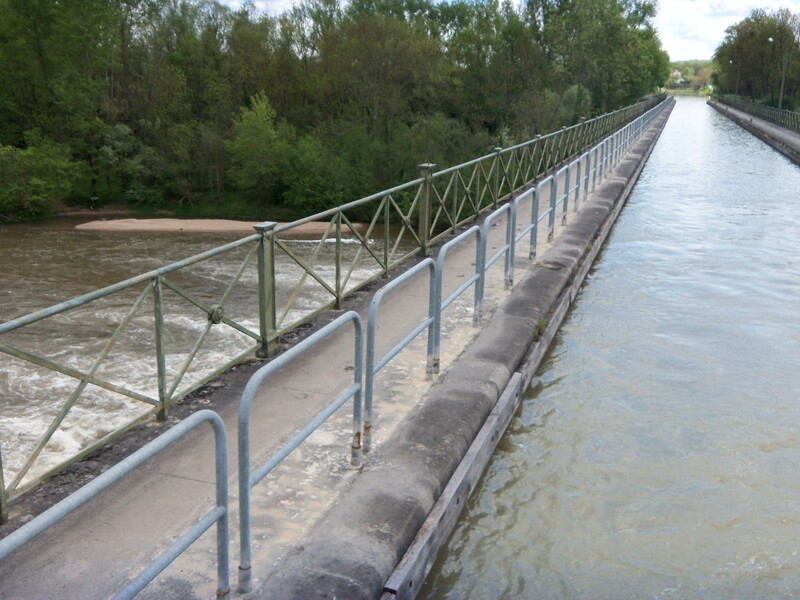 Thus far, my favorite lock has been Pont Canal du Guetin, the elevated aqueduct over the Loire River. Ahead, water in the lock lies smooth as silk. Below, the Loire river water tumbles past in a rush of white. Salmon ladders add to the froth. 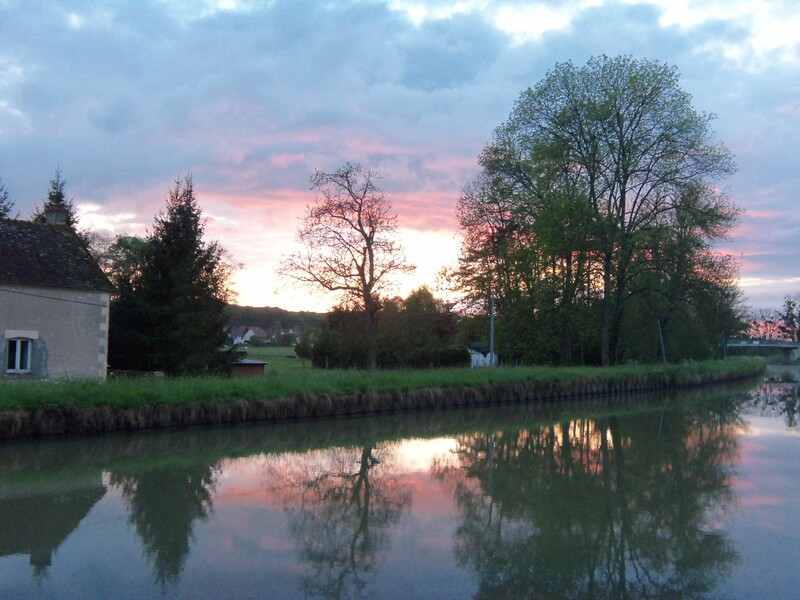 The 174 kilometer canal – begun in 1783 and completed in 1842 – was built to facilitate floating wood cut in the Morvan forests to Paris. Although we have seen a couple of commercial barges, today, the canal caters mostly to recreational traffic. In my last blog, I mentioned that I was chagrined that none (not one) of us spoke French. How, I wondered, would we survive? Well, we have survived (if not thrived) with smiles and hand signals. In addition to carrying a French/English dictionary, I have a wordless, picture dictionary which is perfect for those of us who look at the phonetic spelling of French and are still confused as to the pronunciation. Despite their reputation for being impatient with non-French speakers, the people whom we have met seem to delight in our combination English, Spanish, and gestures. Charades. I’ve always been good at charades.